Men, one place where you can where a short sleep button down shirt, buttoned down lower than you would on the street, is the beach! A short sleeve casual cottom button down shirt is always a great thing to wear with your swim trunks. If you look at men’s fashion sites such as Mens Style Pro, you can get wonderful ideas for how to look effortlessly hunky at the beach. This model looks super cool, he’s got his hat beach glasses, and I love the lighter blue shirt combined with the pretty blue swim trunks. Looking hot! These swim trunks are in a very flattering color, not to light blue, but not too dark either. 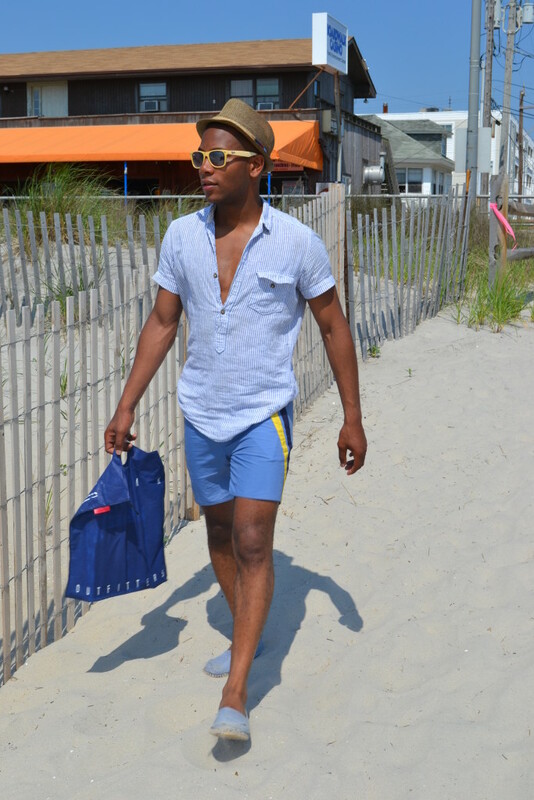 The trunks are by PASTE, the style is Retro Fit “Blue Navy Yellow”. Check out Mens Style Pro for more cool men’s fashion ideas.